Soundbars and soundbases are two such speaker systems. Very closely related from a design perspective, they aim to cure the main drawback of modern, slim television sets - namely the weak, tinny sound quality associated with their small built-in speakers. Both designs are bona-fide stars in terms of sales figures and popularity, due to their ease-of-use, low price, small size and often superb audio quality. If you’re curious but still unacquainted, let’s delve into their features, similarities and differences - and give you everything you need to choose between them. How Do I Connect Them? How Do I Set The Controls? Soundbars are active (self-powered) and can be used with a television set, home projection setup or indeed any other playback source - even just a smartphone, assuming it has Bluetooth streaming. Most modern units do; this recent Polk system (full review here) is a good example. It packs in Bluetooth along with a whole wealth of other features, showing that soundbars are just as capable as other, bigger systems. They usually (but not always) come with a separate subwoofer - see the section below for more detail. Closely-related to a soundbar in looks and design, a soundbase is even more of a dedicated TV audio solution. Instead of being a pole or bar shaped, a soundbase has a more rectangular, boxy appearance. 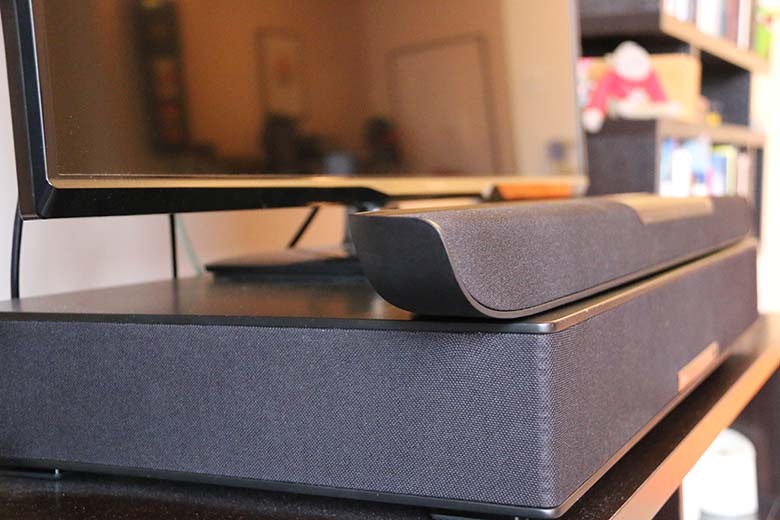 It’s designed to sit below your TV, with the screen on top of it - which is why so many bases come with weight ratings! The mesh- or fabric-covered front contains several forward-firing speakers, and the rear of the unit may often contain a bass port (or a passive radiator). A good, albeit expensive, example is the Raumfeld Sounddeck (full review here), which is one of the best bases available today. Let’s talk about soundbars first. The pros definitely include their quirky yet contemporary design, their small footprint, and the uncanny ability to blend in visually, while still managing to impress sonically. Soundbars can be fairly inexpensive but a good one at any given price tier can easily challenge a similarly priced conventional speaker system. They’re ideal if you have limited space. The drawbacks of a soundbar setup are…well, not that many actually. Audio spread can be a problem - even though they house a number of internal drivers, a soundbar simply cannot compete with the wide sound stage of stereo setups with speakers positioned far apart. Playback featuring extreme panning effects sounds (travelling from left to right) simply do not translate that well when played through soundbars. The other thing would be about internal driver size. However creative the design of a speaker, a smaller-size driver simply cannot compete with a larger one, at least in terms of volume. Portraying a sense of size and strength in the audio can be an issue. Adding a subwoofer usually manages to cure this issue - although, as we said, many bars come with their own. Subwoofers are self-powered and they not only add more wattage (that is, more power), but also additional, previously-missing low frequencies. In doing so, they free the main unit’s speakers from bass duties, letting it handle the upper frequency registers with aplomb. The result? Much fuller audio! If you’re looking for a good one to use as an add-on, might we suggest the Pioneer SW8-MK2? Soundbases have similar pros and cons. Very obviously, they are bigger, and take up more space underneath and around your TV. They can also suffer the narrow stereo sonic spread discussed above - although plenty of models come with modes designed to alleviate that. This is down to having smaller drivers than regular home theater speakers, Although this is where the cons started turning to pros. For starters, bases don’t come with a separate subwoofer. They don’t need one. In terms of having more depth from a size/dimensions perspective, certain models actually a feature a built-in down-firing active subwoofer, taking care of the bass frequencies. In a weird way, they can actually take up less space than a soundbar and subwoofer combo. The power output of a soundbar/soundbase is measured in watts - just like with more conventional powered speaker systems. Both types can come in various wattages - from 30 watts, all the way up to 300 watts, and even more. Any decent unit (especially with a sub present) will have you raising your eyebrows. The real upmarket soundbars will have your neighbours needing a friendly chat with you. A word on surround sound. Many will claim that they can do it, but honestly, it’s mostly a gimmick. For a sound to travel from one speaker to another, speakers really need distance between one another. This is the one certain thing that soundbars and soundbases are really lacking. So at most you might get some ‘enhancement’ or ‘depth’ (quotes deliberate) out of a ‘surroundbar’, but never the real thing. It’s rare to find passive soundbars and soundbases - in other words, ones that need a separate amp to power. When you do, these can be used with powered A/V receivers or standalone hifi amps. These are often used as part of true surround home theater setups (normally as the main center front speakers), and if you're looking to include one of these, it might be worth checking out something like the Klipsch G-42, which is an excellent example of a passive sound bar. Just make sure you have a good amplifier! The bottom line here is this. If you have a smaller space or limited room in your apartment (and you don't want to scare the neighbours) then a soundbar and subwoofer combo is an excellent investment. It's also a good choice if you have less to spend, as they are usually very affordable. You’d go for a soundbase if you have limited floor area, or a slightly bigger room which you want to fill with sound. They are also a good option if you have a larger budget. And if you're still on the fence, don't worry. We go into plenty more detail in the sections below. If the looks of soundbars and bases are closely related, size and intended placement is where the two designs vary most from each other. The width (or length if you like) of a soundbar is often matched to that of most modern TV screen dimensions. It can vary of course, but generally speaking, soundbars are quite wide and designed to sit below a wall-mounted TV. In some cases, like this Sony HTST5, they can be mounted on the wall above it. Soundbases on the other hand, as their name brilliantly explains, are designed as a base for a TV to sit on, resting on a desktop or similar surface. Their size and appearance is again matched to the somewhat uniform dimensions of desktop stands for commercial TVs, which explains the even smaller (compared to a soundbar) footprint. They have weight ratings - or at least they will either give you a maximum weight of TV that can be rested on them, or a maximum size in inches, because there is no standardisation and manufacturers are annoying. Either way, a few quick minutes with a tape measure or online will be able to figure out if you can put your TV on top of them. Both designs are quite successful at blending in from a visual standpoint and at first glance they can often be perceived as part of the TV set. Until the sound kicks in, that is! The easy connectivity of both soundbars and soundbases is another major reason for their popularity. They are just a breeze to hook up. No entangled messy leads on the floor - just a discreet ‘source’ wire and a power cord. In some cases you won’t even have to have that source wire, assuming they have Bluetooth. But more on that later. In terms of physical connections, their input and output options resemble those found in A/V receivers, even if they are a tad more simplified. At their most basic, you’d be certain to find at least a pair of analog RCA inputs (the white/red circular plugs). In higher spec models, digital ins and outs are universally present, often featuring both the optical and coaxial variety. When connecting a super-high definition audio-visual source such as a Blu-ray or HD TV, you should really look out for soundbar/soundbase units featuring HDMI connections (up to four or five in some cases), since they offer the highest audio resolutions. It would be very strange, in this day and age, if they didn’t have any. As mentioned, subwoofer outputs are mostly universal, and these normally look either like a mini-jack or a single RCA output type sockets. Some, like the Polk model in the photos, have a wireless subwoofer. There are still a few other types of connections you may come across, but they are more rare and model-dependent. Occasionally you’ll also see a multi-pin input labeled ‘Dock’ and this is reserved for iPod/iPhone/MP3 docks, or as a connection for break-out cables, allowing a soundbar to be a part of a surround setup. In the more upmarket models you may come across a network or Ethernet ports, for setting up wi-fi wireless playback zones. Analog audio inputs on soundbars/bases are either RCA (phono plugs) or 3.5mm (mini-jack plugs). Optical digital ins and outs serve to connect Blu-Ray/DVD players. A dedicated port may be a multi-pin type for additional accessories such as Apple/Android docks or surround sound speaker extension (break-out) cable connections. HDMI ports provide a high-resolution connection from current spec TV sets to external audio-visual devices. Just like with A/V receivers, you may find several HDMI inputs as well as an additional HDMI output. This is rare, and can again be RCA (phono plugs) or a 3.5mm (mini-jack plug). A Line Out allows for connecting a second soundbar/soundbase (daisy-chain style connection). Just as with many other contemporary A/V receivers and speakers, the audio connectivity of soundbars and soundbases does not stop at the physical input and output connections. Both formats are firm favorites for streamers. If indeed you happen to be on a steady Netflix (or Youtube, Soundcloud, Amazon and iTunes/Apple Music) diet, you could do worse than buy yourself a nice Bluetooth-equipped wireless-capable soundbar or soundbase setup. Bluetooth is a digital wireless protocol allowing the transmission of audio (or visual) media between Bluetooth capable devices such as smartphones, tablets, laptops or desktop PC. Apple AirPlay is a wireless app/feature that comes with the MacOS allowing iOS devices(iPod, iPhone, iPad or a Mac stream audio wirelessly. The system is easy to enable and suitable for wireless multi-room systems. This would be a bundled or an optional App that turns your Smartphone (iPhone or Android) into a soundbar/base remote controller. Some soundbars/bases can be connected to an existing WiFi home network with the help of an (optional) network/Ethernet port. This would allow you to take your source player or speaker to any part of your home and stream wirelessly-even hi-res files! AptX is a wireless codec/protocol enabling a higher audio resolution when streaming over Bluetooth. For controlling volume, tone and source selection you can rest assured that the included remote control will handle those beautifully. This is usually a credit card-sized remote, although they can reach a full-size (TV style) with some more expensive and better equipped soundbars/bases. Included remotes are OK for basic functions, but if you’re planning to use a soundbar/base for streaming you should really download the smartphone app (any self-respecting Bluetooth-capable soundbar should come with one). Smartphone apps are hugely important for wireless speakers - they just make things so easy. They can offer a multitude of features such as presets offering shortcuts for specific songs, albums or artists, and can have third party streaming services such as Spotify built into the app itself so you aren’t redirected to a separate app/browser, etc. Since neither soundbars nor soundbases generally feature hardware EQ tonal options, a smartphone app can include EQ presets, and even feature optional acoustic calibration, basically tuning the overall tonal character of the speaker to the acoustics of your room. This superb soundbar system by Sony is stupefyingly stylish and thin. You really need to look twice to acknowledge it. This is a 2.1 affair, where the (.1) bit is the included wireless subwoofer. Sony have really packed this with innovative tech. You have 400 watts of clear hi-res capable audio playback, Bluetooth, Multi Room function, full 4k support through 3 HDMI Arc ports, Dolby TrueHD & DTS-HD Master Audio...it’s a beast! Another Sony, but this time a soundbase. Representing great value-for-money, this soundbase features a built-in down-firing sub while still managing to remain discrete in size. Packing 170 watts of power, this should be enough for most people. What is really great is the inclusion of a number of wireless features and functions, such as the free SongPal app. You can control it all with your phone or tablet. This great base by Sanyo is much more simple and much less powerful. Only 70 watts, so we’d say this is for the casual media enjoyment only. Still, you have the latest Bluetooth protocol (4.1) for wireless streaming, so forget the cables. It has a built-in subwoofer and a remote control, and it sounds impressive for the money. One thing that it doesn’t have? HDMI ports. Still a steal if you ask us - it’s a good budget option. Although it's been superseded by some of Polk's latest offerings, we still adore this little unit. It's brilliantly simple to use, comes with an excellent wireless subwoofer, and an absolutely fantastic remote. Sound is pretty good, too – it's an excellent mid-range soundbar. You can check out our full review of the system here. Arguably one of the finest bars on the market. It offers titanic sound, not to mention the added bonus of the superlative SONOS ecosystem. While it is quite pricey, and immersion in that closed ecosystem isn't good for anyone with other models, it's still a total beauty. Since you're spending this much, you should probably check out the SONOS SUB too.